Director Shane Black is currently out making the rounds on a massive press tour for his latest film, but people seem much more interested in his next project. Though The Nice Guys is a great film, everyone wants to know more about his Predator sequel which is due out in early 2018. And he has been kind enough to give some fairly big details about it during this current round of press in the U.K.
First off, speaking with Empire at a Q&A, the subject of Predator 4 eventually came up. Black has been very quiet in regards to specific details, but he finally revealed something about the hero of the film, which sadly will not be Arnold Schwarzenegger. Instead, we'll be getting a brand new hero. "The hero of the new one, the name I've given the guy in Predator right now is Quinn Mackenna. And that may change." 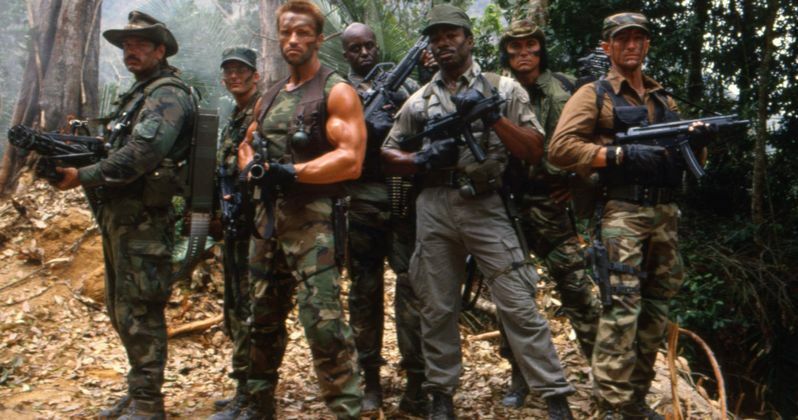 Arnold Schwarzenegger played Dutch in the original 1987 Predator alongside Black who played Hawkins. Predator remains one of Arnie's best turns as a big time action hero, so it is definitely a potential disappointment that the governator won't be the main focus of The Predator. Black has had meetings with Schwarzenegger though and since this film is a continuation of the franchise and not a reboot, it is very possible and many would say likely that Arnold will be back in some capacity. In addition to the news that The Predator's lead good guy will be named Quinn Mackenna (which is a very fitting "Predator" hero name), Shane Black also gave some insight as to how he plans to go about reinvigorating the franchise and where he is looking for inspiration. As it turns out, Black has one of the all time greats, Ridley Scott in mind and is looking at how he handled Alien to draw on for The Predator. Here is what Black had to say in his interview with IGN. "How can I follow in the footsteps of someone who re-invents and brings that much event-ized quality to a pulp franchise. The worst thing you could hope for in one of these is a shot in bright sunlight of a field and the Predator just kind of walks on and 'hello' - you want to do... I keep going back to Ridley Scott, the way he captured the alien in that first movie. The sense of mystery and portent. If we could just cut into a little piece of that - that sort of vibe - and then I think there's humor to be had too. And tonal shifting." Black is known for being able to balance a light tone with serious action going all of the way back to Lethal Weapon, which he wrote and The Nice Guys is very much in the same vein, just without a super violent alien killing machine. The last time we saw the famous creature on screen was in Predators in 2010, which did modest box office business and was met with a mixed reception. Aside from a poster, we don't have any other solid info on casting or anything like that, but we will surely learn more as Black gets to work once the press tour wraps up for The Nice Guys. The Predator is set for release on February 9, 2018.